Hi everyone! Here is another July issue Scrap n' Art Online magazine project. Thanks to Chameleon Art Products for sponsoring the magazine that month. 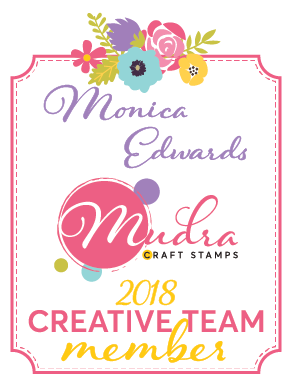 Writing Tools: Chameleon Pens; Adhesives: Beacon Adhesives “3-IN-1 Advanced Craft Glue”, “Zip Dry”; Ribbon: May Arts "Silk"; Die cuts: Spellbinders® “Grand Calibur® machine (GC-200)”, “M-Bossabilities®: Mystic", “Nestabilities® Valiant Honor" Creative Expression: Time Square; Cardstock: Copic: X-Press IT; Stamp: Justrite Stampers "With Sympathy"
Tip: Outline your colored images with CG3 Chameleon pen to make the image appear more 3d. It's SO gorgeous Monica! Love the bright colours with the white!